Lair is your nice home in Little Big Snake game! This is the place that leads you to the battles. You can see that there are two buttons appearing in front of you on the screen. The big one will take you directly to the battle, while the small one will let you choose your friends to play. 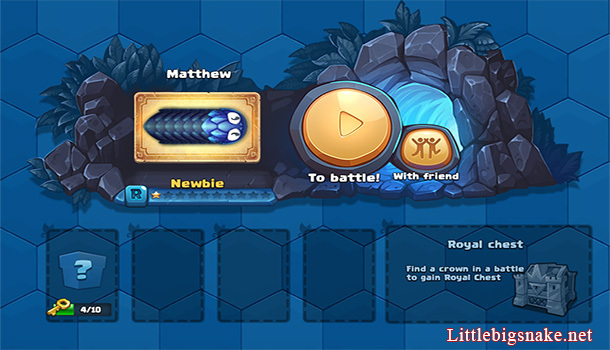 If you click the big button, you will spawn into a vast arena full of creatures as well as online connected opponent snakes controlled by real players. Try to battle them all, survive longer so you can get crowned! For the small button, this is where you can play with your friends. To add friends, you need to your friend’s name or ID into a box, then click the Search button. After you connect with the friends, you guys can enjoy the game together! When you finish the combat, you will return to Lair for awesome chests and presents.